Good morning Iditarodians (or is it Iditarotarians?) - and it is a *late* morning, with daylight savings time. Yawn. 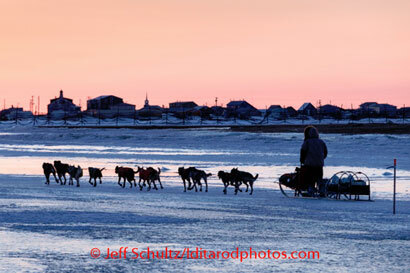 While we were sleeping and springing our clocks forward, the leaders in the 2014 Iditarod race were mushing across Norton Sound from Unalakleet to Skatoolnik. First out of Ska was Aliy Zirkle, still in the lead, but now Jeff King has moved up to second, passing Martin Buser, with Sonny Lindner still up there. (That's King's team pulling into Skatoolnik, at right.) And now both Dallas and Mitch Seavey, son and father, champions in 2012 and 2013, have moved up into the mix. Last night I thought there were five teams left who could win, now I'd have to say there are seven, as Aaron Burmeister is up there too. Here's the position, with Skatoolnik hidden under the orange #70 tag (Sonny Lindner, not yet moving) and Koyuk at the top of the Norton Sound, now solidly iced in; #10 is Zirkle, #17 King, and #36 Buser. The racing is incredibly close; Zirkle has only 6 miles on King, and 9 on Buser. The top seven are within 12 miles of each other. Ultimately this isn't going to be decided by who moves faster across the ice on Norton Sound, it will be the fatigue of the teams and how much rest they'll need when they reach Koyuk. From there it is still over 150 miles to Nome. Most likely the teams will rest for a while in the heat of the afternoon, then take off late afternoon for a final push to White Mountain, where they have to take an 8-hour rest.